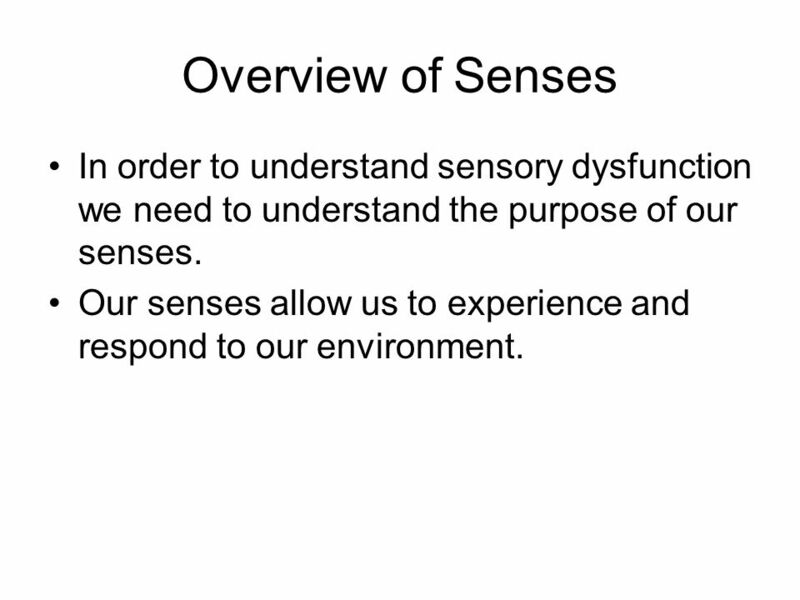 2 Overview of Senses In order to understand sensory dysfunction we need to understand the purpose of our senses. Our senses allow us to experience and respond to our environment. 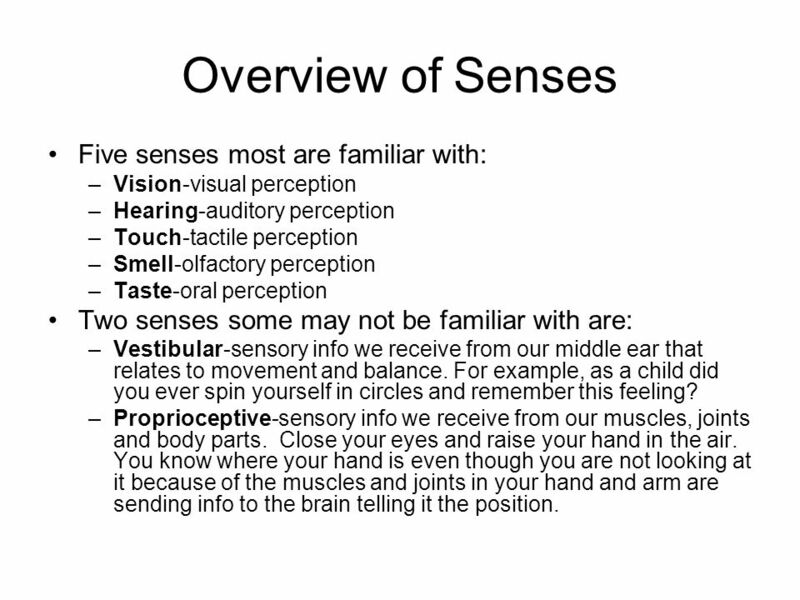 Vision-visual perception Hearing-auditory perception Touch-tactile perception Smell-olfactory perception Taste-oral perception Two senses some may not be familiar with are: Vestibular-sensory info we receive from our middle ear that relates to movement and balance. For example, as a child did you ever spin yourself in circles and remember this feeling? Proprioceptive-sensory info we receive from our muscles, joints and body parts. Close your eyes and raise your hand in the air. You know where your hand is even though you are not looking at it because of the muscles and joints in your hand and arm are sending info to the brain telling it the position. 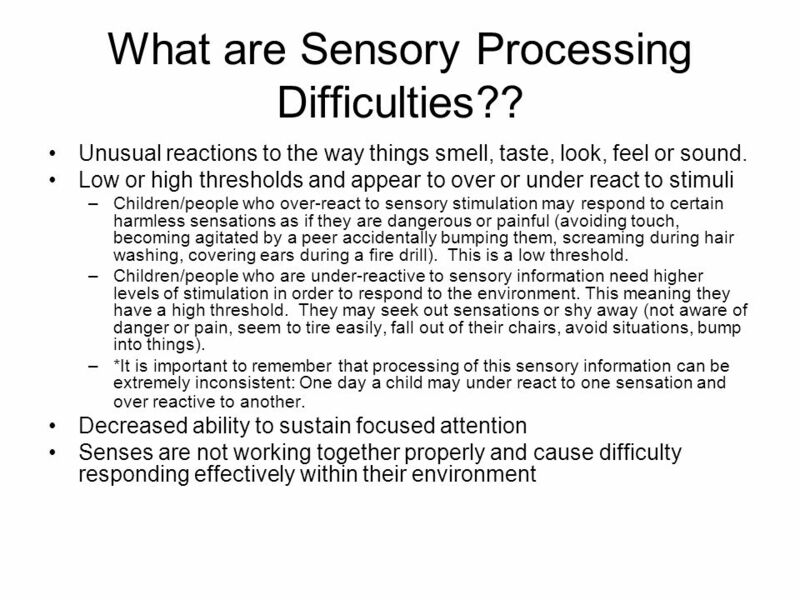 5 What are Sensory Processing Difficulties?? Try to observe when melt downs and distress occur for “no apparent reason” Change the sensory environment to see if this helps prevent similar meltdowns in the future. 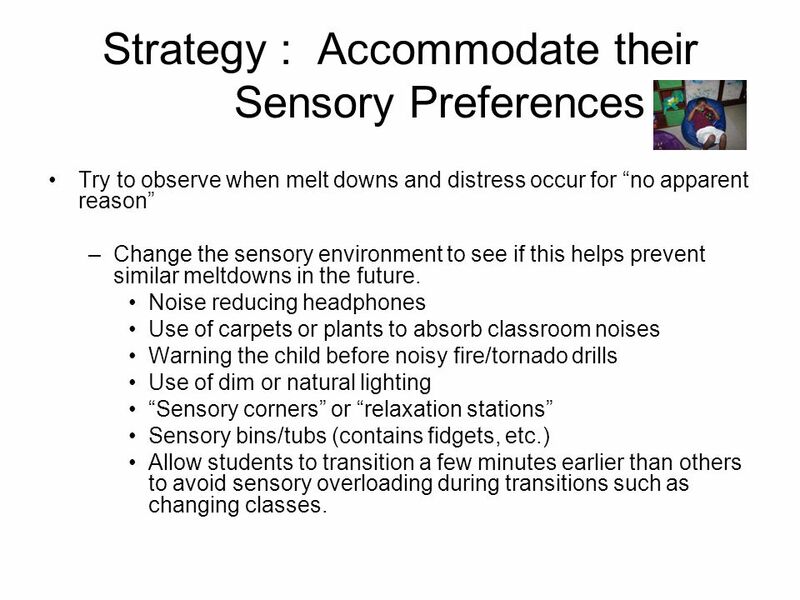 Noise reducing headphones Use of carpets or plants to absorb classroom noises Warning the child before noisy fire/tornado drills Use of dim or natural lighting “Sensory corners” or “relaxation stations” Sensory bins/tubs (contains fidgets, etc.) Allow students to transition a few minutes earlier than others to avoid sensory overloading during transitions such as changing classes. Calming activities can be scheduled throughout the day: Some examples include: deep pressure (weighted lap pads, firm hugs, massage, chewing), rhythmic vestibular stimulation (swinging, rocking in a rocking chair, jumping, bouncing, vibration), proprioceptive stimulation (movement breaks, fidget toys, “heavy work” breaks), and use of a “quiet space/area” relaxation techniques (such as “take a deep breath and count to ten”).6 Sometimes you may see a person with autism rocking their body back and forth or waving their arms and hands, or wringing their fingers. Encourage the child to select and request an alternative sensory strategy e.g. twisting a paperclip may replace the finger ringing, and achieve the same sensory input in a less disruptive and distracting way. Provide a consistent, predictable environment with minimal transitions. 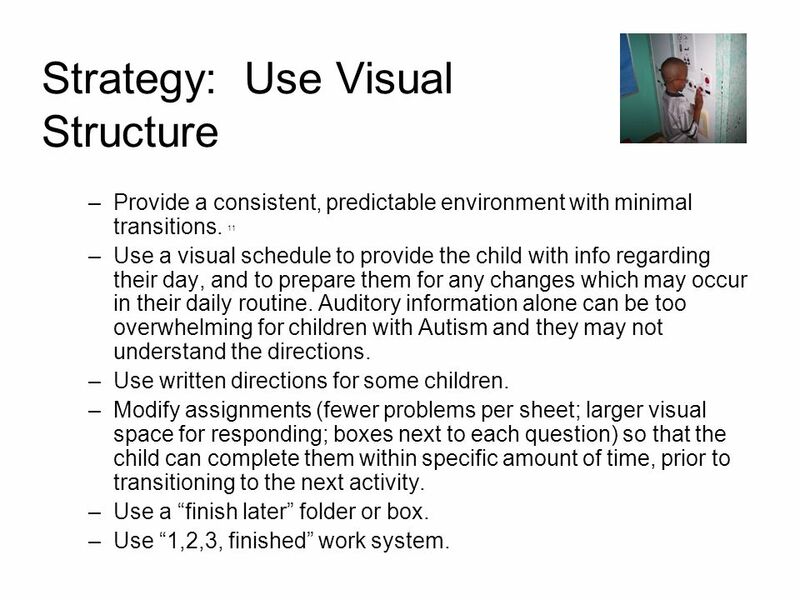 11 Use a visual schedule to provide the child with info regarding their day, and to prepare them for any changes which may occur in their daily routine. Auditory information alone can be too overwhelming for children with Autism and they may not understand the directions. Use written directions for some children. Modify assignments (fewer problems per sheet; larger visual space for responding; boxes next to each question) so that the child can complete them within specific amount of time, prior to transitioning to the next activity. Use a “finish later” folder or box. Use “1,2,3, finished” work system. Often children with Autism concentrate on the mouth moving and not on what is being said thus not hearing the auditory information, visuals provide a concrete example to them of what is expected. 10 What can I take out, put in and/or teach? 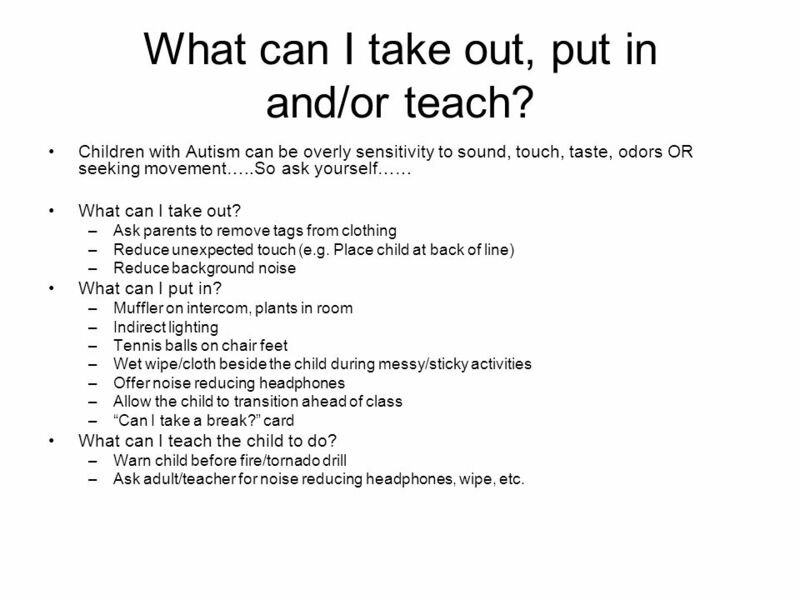 Children with Autism can be overly sensitivity to sound, touch, taste, odors OR seeking movement…..So ask yourself…… What can I take out? Ask parents to remove tags from clothing Reduce unexpected touch (e.g. Place child at back of line) Reduce background noise What can I put in? Muffler on intercom, plants in room Indirect lighting Tennis balls on chair feet Wet wipe/cloth beside the child during messy/sticky activities Offer noise reducing headphones Allow the child to transition ahead of class “Can I take a break?” card What can I teach the child to do? Warn child before fire/tornado drill Ask adult/teacher for noise reducing headphones, wipe, etc. 11 What can I take out, put in and/or teach the child? Again ask yourself… What can I take out? Long sessions of seated work What can I put in? Visual boundaries of space (e.g. Tape on floor) Movement breaks / errands Air cushion / fidget toy (e.g. paperclip) What can I teach the child? 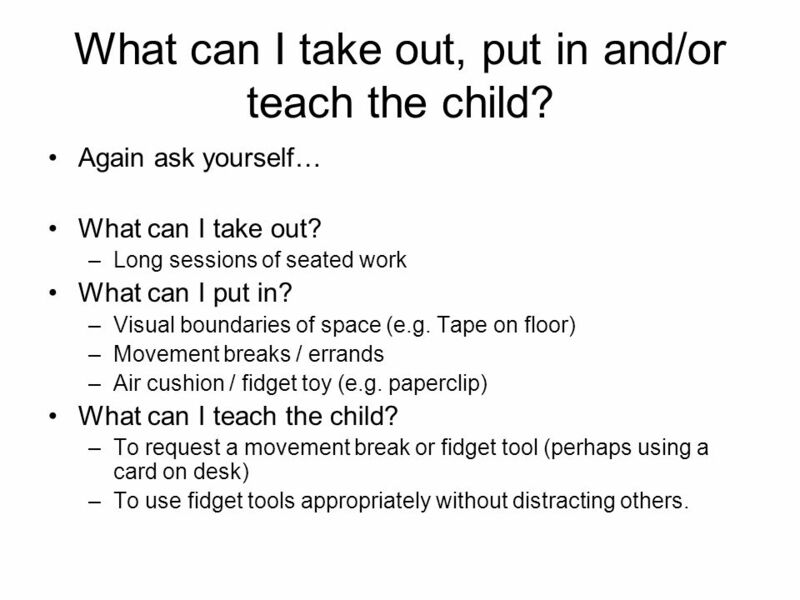 To request a movement break or fidget tool (perhaps using a card on desk) To use fidget tools appropriately without distracting others. We can provide students with a safe, inviting, visually appealing area, which offers a variety of multi-sensory experiences, so that students can retreat from the everyday distractions and sensory demands of the regular classroom, and “regroup” or “reorganize” themselves when in or near the point of “sensory overload”. This helps to relieve agitation, and promote relaxation and a sense of wellbeing. Research has shown that students demonstrate increased alertness, task persistence, calmness and a sense of control when in such sensory environments. When you see a behavior/reaction that does not match the situation…. Think to yourself… “Could it be due to sensory processing differences?” (increased sensitivity to sound, touch, taste, odors OR seeking movement) If so… “What can I… Put in, Take out Teach the child to help keep the child in an alert, “ready to learn” state, while decreasing disruptive and distracting behavior”. 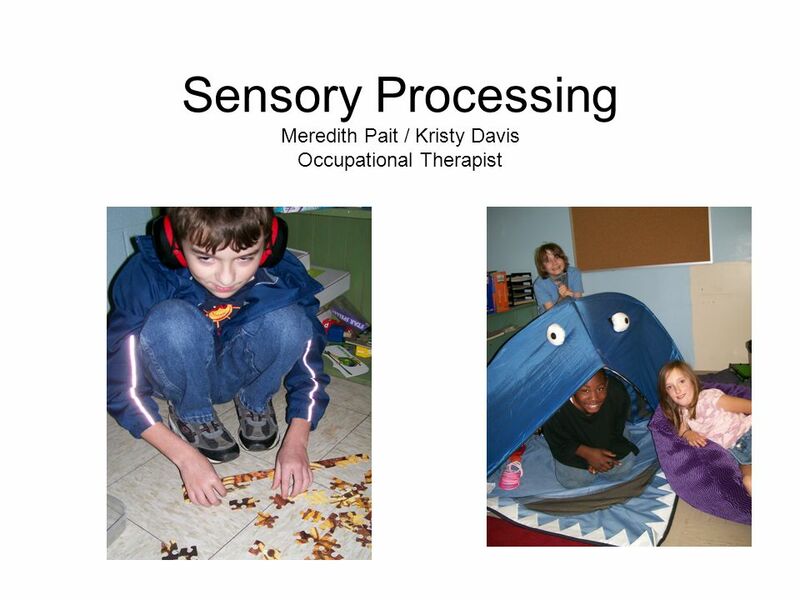 Download ppt "Sensory Processing Meredith Pait / Kristy Davis Occupational Therapist"
1 Education, Research and Support Factors That May Affect Learning TSA Educational In-Service. Topics Description of Sensory Systems Sensory Processing Differences in Persons with ASD Impact of Sensory Processing Differences Strategies for Preschool. Brought to you by Autism Support Daily & Laurie Euler Laurie has experience working with special needs and at risk youth and is available for consulting. 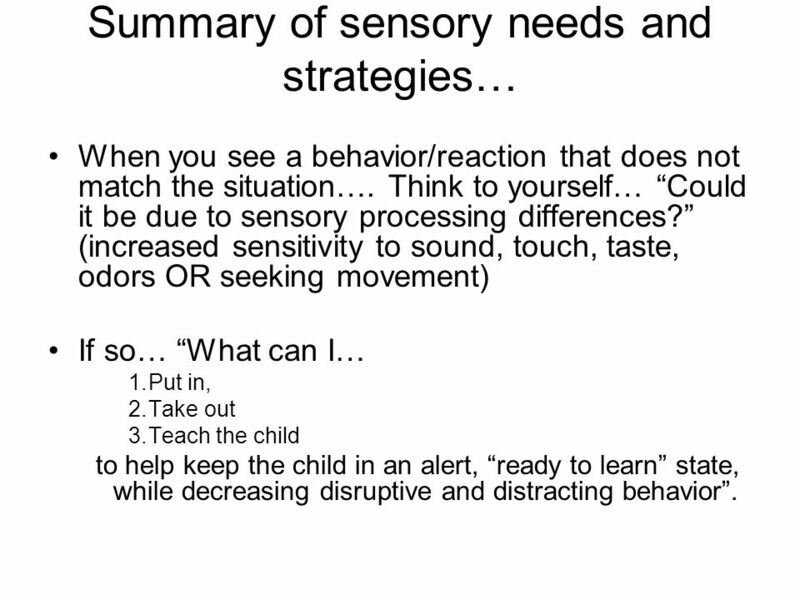 SENSORY PROCESSING AND RELATED BEHAVIORS Dena Hayashino, COTA. 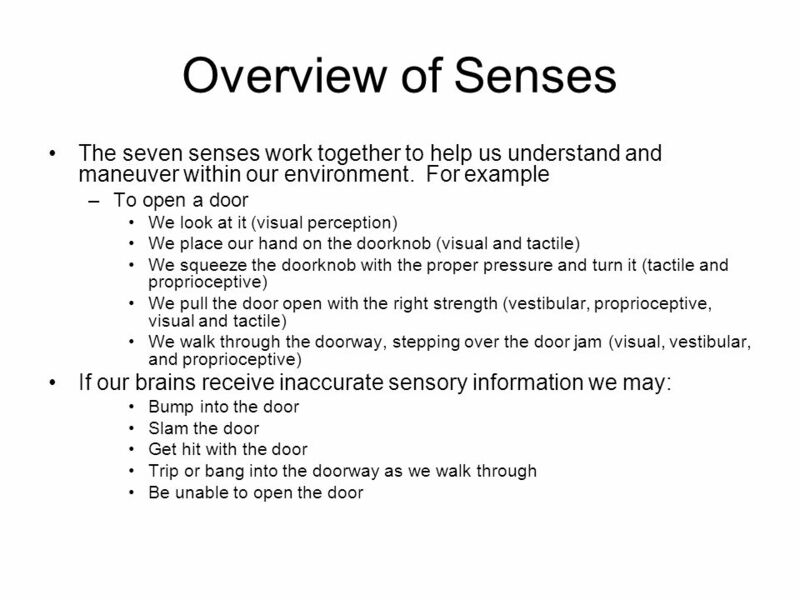 Sensory Processing Considerations for ABE Learners Susan Spear, PhD, OTR/L COABE March 18, 2014. 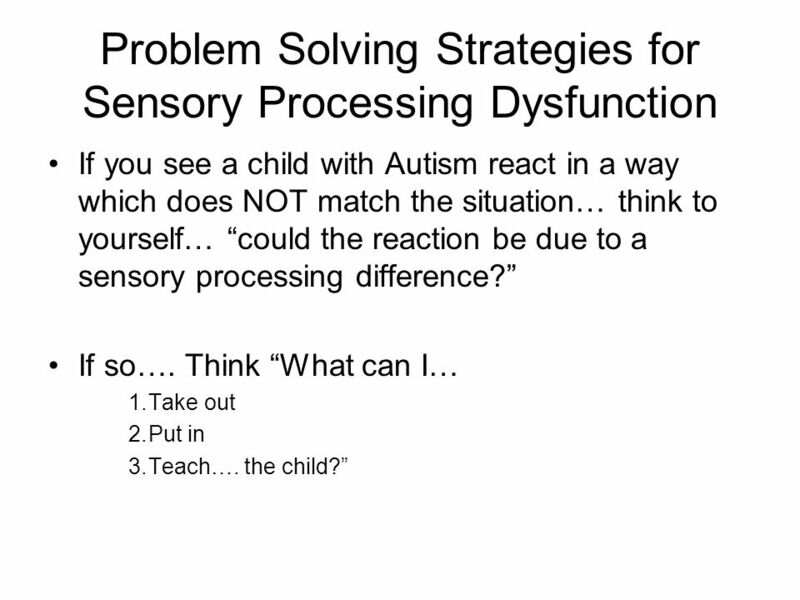 SENSORY IMPLICATIONS FOR TEACHING ASD STUDENTS. Characteristics of the Sensory System  7 basic sensory stems within nervous system –SoundMovement –TouchBody. Supporting Children’s Diverse Learning. All of these children are demonstrating signs of problems with sensory integration: Thomas covers his ears when. Introduction to Autism. What is Autism? Autism is a group of disorders. People with autism have problems with –Communication –Relationships –Behavior. 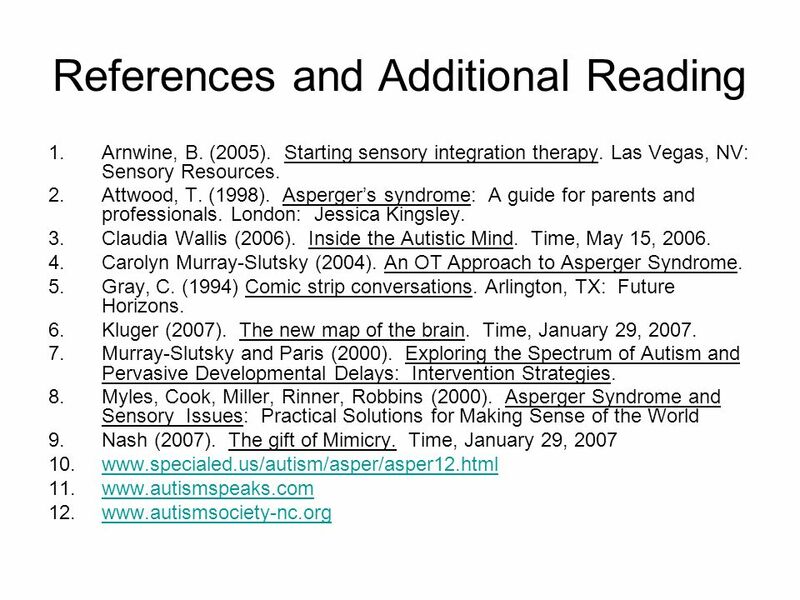 Understanding Autism Spectrum Disorder November 2011. Autism Across the Spectrum. What is Autism Pervasive developmental disorder Symptoms typically appear before the age of three Affects communication, social. Educator Training A Practical Guide For Working With Students With Autism Spectrum Disorders Ruth Lee Pat Krouson Denisse Santos Leslie Allore.